Daisetsu Teitaro Suzuki (鈴木 大拙 貞太郎 Suzuki Daisetsu Teitarō; he rendered his name "Daisetz" in 1894; 18 October 1870 – 12 July 1966) was a Japanese author of books and essays on Buddhism, Zen and Shin that were instrumental in spreading interest in both Zen and Shin (and Far Eastern philosophy in general) to the West. Suzuki was also a prolific translator of Chinese, Japanese, and Sanskrit literature. Suzuki spent several lengthy stretches teaching or lecturing at Western universities, and devoted many years to a professorship at Otani University, a Japanese Buddhist school. D. T. Suzuki was born Teitarō Suzuki in Honda-machi, Kanazawa, Ishikawa Prefecture, the fourth son of physician Ryojun Suzuki. The Buddhist name Daisetsu, meaning "Great Humility", the kanji of which can also mean "Greatly Clumsy", was given to him by his Zen master Soen (or Soyen) Shaku. Although his birthplace no longer exists, a humble monument marks its location (a tree with a rock at its base). The samurai class into which Suzuki was born declined with the fall of feudalism, which forced Suzuki's mother, a Jodo Shinshu Buddhist, to raise him in impoverished circumstances after his father died. When he became old enough to reflect on his fate in being born into this situation, he began to look for answers in various forms of religion. His naturally sharp and philosophical intellect found difficulty in accepting some of the cosmologies to which he was exposed. Suzuki lived and studied several years with the scholar Paul Carus. Suzuki was introduced to Carus by Soyen Shaku, who met him at the World Parliament of Religions held in Chicago in 1893. Carus, who had set up residence in LaSalle, Illinois, approached Soyen Shaku to request his help in translating and preparing Eastern spiritual literature for publication in the West. Soyen Shaku instead recommended his student Suzuki for the job. Suzuki lived at Dr. Carus's home, the Hegeler Carus Mansion, and worked with him, initially in translating the classic Tao Te Ching from ancient Chinese. In Illinois, Suzuki began his early work Outlines of Mahayana Buddhism. Besides living in the United States, Suzuki traveled through Europe before taking up a professorship back in Japan. Suzuki and his wife dedicated themselves to spreading an understanding of Mahayana Buddhism. Until 1919 they lived in a cottage on the Engaku-ji grounds, then moved to Kyoto, where Suzuki began professorship at Otani University in 1921. While he was in Kyoto, he visited Dr. Hoseki Shinichi Hisamatsu, a famous Zen Buddhist scholar, and discussed Zen Buddhism together at Shunkō-in temple in the Myōshin-ji temple complex. 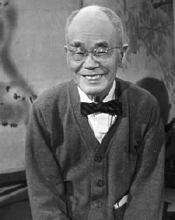 In 1921, the same year he joined Otani University, he and his wife founded the Eastern Buddhist Society. The Society is focused on Mahayana Buddhism and offers lectures and seminars, and publishes a scholarly journal, The Eastern Buddhist. Suzuki maintained connections in the West and, for instance, delivered a paper at the World Congress of Faiths in 1936, at the University of London (he was an exchange professor during this year). Besides teaching about Zen practice and the history of Zen Buddhism, Suzuki was an expert scholar on the related philosophy called, in Japanese, Kegon, which he thought of as the intellectual explication of Zen experience. Suzuki received numerous honors, including Japan's national National Medal of Culture. Suzuki is often linked to the Kyoto School of philosophy, but he is not considered one of its official members. Suzuki took an interest in other traditions besides Zen. His book Zen and Japanese Buddhism delved into the history and scope of interest of all the major Japanese Buddhist sects. ...in Dr. Suzuki's activities, Buddhism came to possess a forward-moving direction with a frontier spirit... This involved shouldering the task of rethinking, restating and redoing traditional Buddhism to transmit it to Westerners as well as Easterners... To accomplish this task it is necessary to be deeply engrossed in the tradition, and at the same time to grasp the longing and the way of thinking within the hearts of Westerners. From there, new possibilities should open up in the study of the Buddha Dharma which have yet to be found in Buddhist history... Up to now this new Buddhist path has been blazed almost single-handedly by Dr. Suzuki. He did it on behalf of the whole Buddhist world. ...D. T. Suzuki, whose most cherished methodology seems to have been to describe some aspect of Zen as beyond ordinary explanation, then offer a suitably incomprehensible story or two by way of illustration. Obviously, Suzuki's approach captured the imaginations of generations of readers. However, while this approach substantiated Suzuki's authority as one with insider access to the profound truths of the tradition, another result was to increase the confusion in reader's minds. To question such accounts was to admit one did not "get it", to distance oneself even further from the goal of achieving what Suzuki termed the "Zen enlightenment experience". "D.T. Suzuki left a record of his early view of the Nazi movement that was included in a series of articles published in the Japanese Buddhist newspaper, Chūgai Nippō, on October 3, 4, 6, 11, and 13, 1936." In this Suzuki expresses his agreement with Hitler's policies as explained to him by a relative living in Germany. "Changing the topic to Hitler's expulsion of the Jews, it appears that in this, too, there are a lot of reasons for his actions. While it is a very cruel policy, when looked at from the point of view of the current and future happiness of the entire German people, it may be that, for a time, some sort of extreme action is necessary in order to preserve the nation." While supporting anti-Jewish measures, and stating that "...extreme action is necessary to preserve the nation." At the onset of modernization in the Meji period, in 1868, when Japan entered into the international community, Buddhism was briefly persecuted in Japan as "a corrupt, decadent, anti-social, parasitic, and superstitious creed, inimical to Japan's need for scientific and technological advancement." The Japanese government intended to eradicate the tradition, which was seen as a foreign "other", incapable of fostering the nativist sentiments that would be vital for national, ideological cohesion. In addition to this, industrialization led to the breakdown of the parishioner system that had funded Buddhist monasteries for centuries. However, a group of modern Buddhist leaders emerged to argue for the Buddhist cause. These leaders stood in agreement with the government persecution of Buddhism, accepting the notion of a corrupt Buddhist institution in need of revitalization. The traditional form of Zen has been greatly altered by the Meiji restoration, but Japanese Zen still flourishes as a monastic tradition. The Zen tradition in Japan, in its customary form, required a great deal of time and discipline from monks that laity would have difficulty finding. Zen monks were often expected to have spent several years in intensive doctrinal study, memorizing sutras and poring over commentaries, before even entering the monastery to undergo koan practice in sanzen with a Zen master. The fact that Suzuki himself was able to do so (as a layman) was largely the invention of New Buddhism. During the Meiji restoration the Nihonjinron-philosophy took prevalence. It emphasizes the uniqueness of the Japanese. This uniqueness has been attributed to many different factors. Suzuki attributed it to Zen. In his view, Zen embodies the ultimate essence of all philosophy and religion. 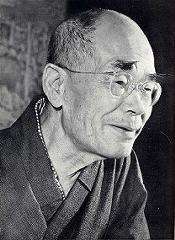 He pictured Zen as a unique expression of Asian spirituality, which was considered to be superior to the western ways of thinking. An anthology of his work until the mid-1950s: Zen Buddhism: Selected Writings of D.T. Suzuki, Doubleday, New York: 1956. Edited by William Barrett. 1 2 Fields 1992, pg. 138. ↑ McRae 2001, p. 71-74. ↑ Faure 1996, p. 89-99. ↑ Sharf 1993, p. 3. 1 2 Sharf 1993, p. 4. ↑ Sharf 1993, p. 7. ↑ Sato 2008, p. 118. 1 2 3 Suzuki, D. T. (1978). Manual of Zen Buddhism. Random House. p. 11.